Do you have both part-time and full-time positions available? I have no F&B experience, can I still apply? Yes, on-the-job-training will be provided for those with no F&B experience. How many stages are typically involved in the interviewing process? Usually, there is only 1 round of interview. For those applying for Management positions, there will be 2 rounds of interview and a background check will be conducted for successful candidates. I am interested in Kitchen position and I do not have a valid food hygiene certificate. Can I still apply? Yes, you can still apply however, you will not be able to work in the kitchen until you have a valid food hygiene certificate. You will be scheduled to work in the service area first. 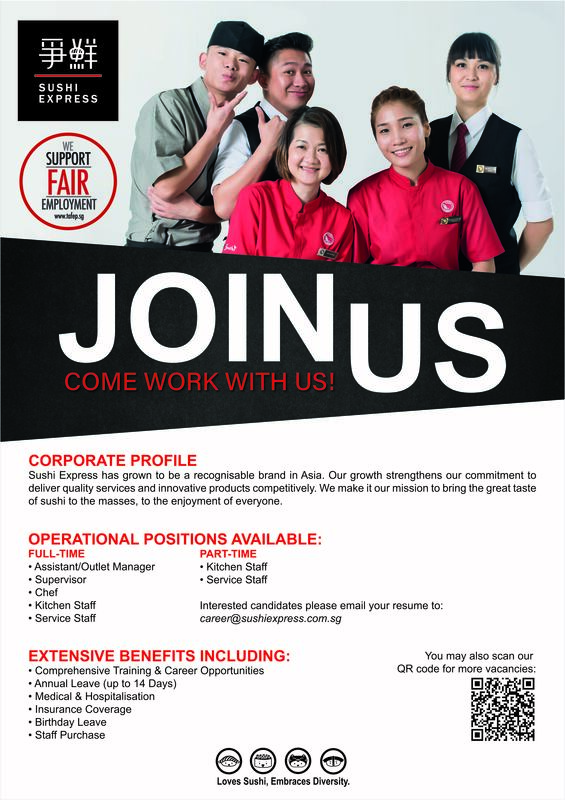 You may walk in for interview at any of our outlets from Monday to Friday, between 2pm to 5pm. Do you have internship available? Where can I find a list of available positions for HQ? Available job openings for HQ are usually listed on Jobstreet. If you are interested in the available position(s), do apply directly via Jobstreet.